For those of you who keep an eye on my literary forays – whether through The Book Nook or on Good Reads – you’ll know that my Year in Books has gotten off to somewhat of a prolific start. Having set my yearly target at 54 books (that’s one a week then bumped up to match last year’s tally), I am already reading #24. That’s right – three shy of the halfway mark and only 25% of the year gone. 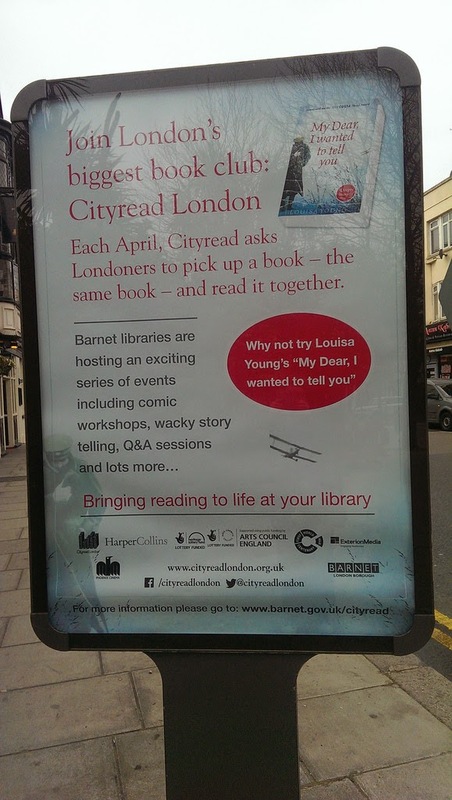 So I was walking up to North Finchley last week and noticed this street poster for CityRead London. Intrigued I came home, googled and found out about this wonderful initiative. Launched in 2012, CityRead London is an annual literary festival held in April each year which is designed to have us read a little something about London…together. Then throughout the month, the book is brought to life with literary events and talks in borough libraries all over the capital. This year it’s Louisa Young’s My Dear, I Wanted To Tell You, a love story set during the first World War. Released early in 2011, this book was short-listed for the Wellcome Prize, the Costa Novel Award and The National Book Awards that same year. There has been a plethora of authors eager to showcase London and all of its charms over the centuries (think back to Charles Dickens in the 1800s who actually wrote part of Martin Chuzzlewit just up the road here in Finchley). So the choice must have been a challenging one with so much to choose from but for all its accolades, I had not heard of Young or this particular book. I love reading about this wonderful city: its history, its place in the modern world or simply as a backdrop to a cracking story. One of my very favourite books of the last few years is John Lanchester’s Capital so with all of this London literary love in mind, I have Amazon One-Click-ed Young’s war tale to Audrey‘s lovely e-pages. What an inspired and clever way to promote reading (and to get me to download yet another book to my kindle this week). It’s a bright shiny Saturday and I have a mountain of chores on my to-do list at Gidday HQ today but I couldn’t help but dwell a little longer between the sheets this morning to finish my 4th book of the year so far, Liane Moriarty’s The Husband’s Secret. (Yes I know – four already!) I have been reading it for the last few days on my tube ride in and out of London and I just couldn’t start my weekend without knowing how it all turned out in the end. My literary start to 2014 has been a good one with three cracking 4-stars and a pleasant 3-star to kick off the year. And having returned to my commuting routine, I thought it was a good time to review 2013, my year spent flicking through Audrey‘s e-pages. Looking back through the list, it was an interesting spread of surprises, themes and disappointments. I ‘favourited’ new writers and revisited old ones, I read about places in fact and in fiction and as is wont to happen along the way, I found myself both disappointed and delighted by my bookish meanderings. The 5-star favourites were few and fabulous. In February I roamed the streets of South West London in John Lanchester’s Capital (2013 #6), revisited a long forgotten fave in March, author Val McDermid and Killing the Shadows (2013 #13) and went nuts in August for Gillian Flynn’s Gone Girl (2013 #35). And the theme through all of these? Who really dunnit. You might be thinking one of two things at this point. She’s extremely discriminating or she’s really stingy with her stars. With 5-star ratings I am – something has to really make an impact to get one of the these so this trilogy comprises the stand-outs of the year. But it’s not all about the stand-outs – I had a myriad of great reads during 2013 with 26, or 48%, of my 54 reads warranting a 4-star rating. So perhaps not so stingy. At the other end of the spectrum, I awarded eight 2-star and one 1-star rating, the latter being #38 in 2013’s Book Nook, Charlotte Moseley’s The Mitfords: Letters from Six Sisters. Having read about the Mitford girls several years ago, I was so looking forward to reading this book of letters. But I struggled and strained right up to the final page, confused by pet names and left bereft of the enchantment I’d hoped for. It felt like it went on forever. Maybe I’m just not a letters kind of girl. And of the eight 2-stars, I was most disappointed by Hilary Mantel’s Bringing Up The Bodies (I made the comment ‘drowned in detail’ in the Book Nook 2013 #47) and the damp squib that was Fifty Shades Freed (#8) which was anti-climactic to say the least. Returning to the 4-stars, four of the 26 writers accompanied me on journeys near and far starting in January with David Revill’s London by Tube: A History of Underground Station Names (#5) now stored on Audrey for dipping back in to now my daily commute has gone ‘tubular’. In May, I tucked a borrowed Paris: The Secret History (#18 by Andrew Hussey) into my backpack and read page after page in the glorious Paris sunshine and in June, I was inspired by my visit to Seattle-A in – yes you guessed it – Seattle to buy Sons of the Profits: There’s No Business Like Grow Business by Seattle’s famous son William Speidel (#25). And then it was back home to old London Town in September with Niall Fergusson’s controversial (as it turned out when I read the reviews) Empire: How Britain Made The Modern World (#36). And last but not least, there were the delightful surprises. Since my entry to Kindle-dom, I have a rule that I will not pay more for an e-book than I would for a ‘paper’ book (and given Tesco across the road offers 2 for £7 on paperbacks…well, you do the maths). This means I’m often found digging around Amazon or Kindle’s Daily Deals for a complete unknown…which can end up being an absolute diamond. As far as the diamonds go, I stepped into an extraordinary expat story with The Cypress Tree, Kamin Mohammadi’s tale of growing up in Iran and then leaving the home of her childhood for London (#3). I took a walk alongside Harold Fry to be reminded of the joy in small everyday things (The Unlikely Pilgrimage of Harold Fry by Rachel Joyce #16). I discovered a new string in CJ Sansom’s bow with his post-civil-war tale in Winter In Madrid (#17) and I was moved by Tan Twan Eng’s story of war-torn Malaysia in The Gift Of Rain (#26). And to round off the year, I came back to London to meet The Radleys (#53), a truly surprising find given vampire tales are not a genre I usually enjoy. So that was 2013, my year in books. As always, feel free to have a browse through the Book Nook tab for my thoughts and links to reviews on all of my literary meanderings. 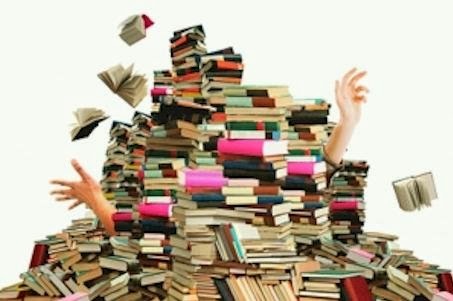 I’ve actually set myself a target of 54 books again for this year – a little more than one per week. So stay tuned. As I mentioned, 2014 is already off to a cracking start! I am a great advocate of anything that encourages people to read. I believe that the ‘written’ word has an extraordinary ability to create new worlds and bring imaginations to life. And I think life (and my commute) has a little less magic and colour without them. 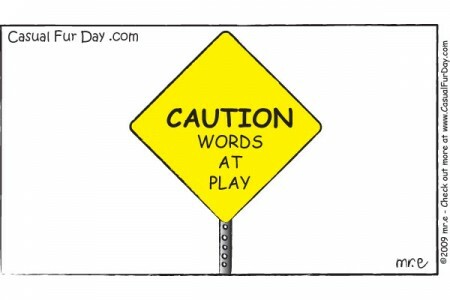 This week I found two inspired ideas that are putting a new and modern spin on word play. The first is BiblioTech, a bookless public library system. Conceived by a County Court Judge and book lover who saw ‘the writing on the wall’ for his papery passions, the library was inspired by the Apple Store experience and will be for visitors to loan e-books and, if needed, an e-reader. The aim is to have at least 10,000 titles available upon opening. Me ‘n’ Audrey would be in our element! 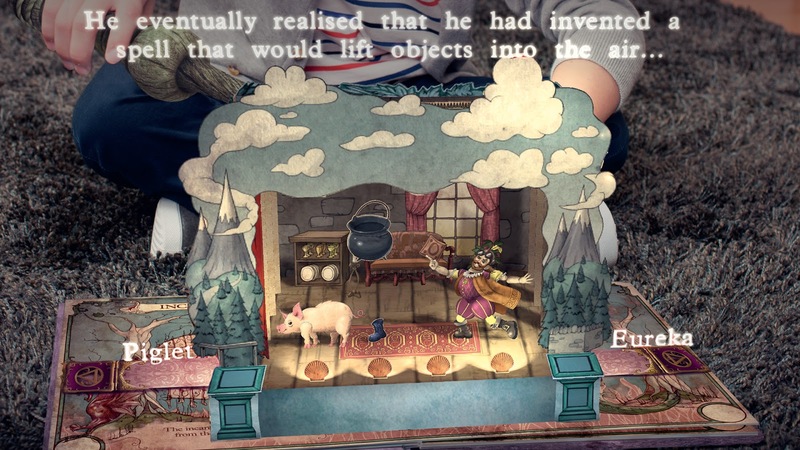 The second is WonderbooksTM, a clever combination of wordsmithery and game play which encourages gamers to interact with the world of books, and more specifically, Miranda Goshawk’s Book of SpellsTM. Using augmented reality technology, ‘readers’ can experience thousands of different tales as they zoom through the halls of Hogwarts, words leaping from the page as they create their very own individual journeys. I may never get off the train! Speaking of journeys, I’m currently reading a fantastic book about the London Underground, delving into the origins of each of the 268 stations on the network (which incidentally took Andi James and Steve Wilson 16 hours 29 minutes and 13 seconds to visit – yes all of them – in 2011’s Tube Challenge). Quite frankly, I’d rather read the book – did I mention it’s fabulous? 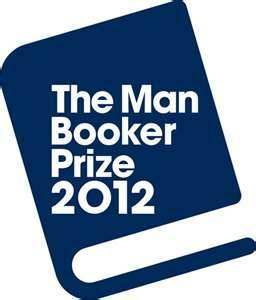 This week the Man Booker Prize shortlist for 2012 was announced, the winner to be announced on October 16th. Of the six authors, I have heard of only one, Hilary Mantel, having read Wolf Hall last year (see #31 in 2011 in The Book Nook). This also means I have actually read a Man Booker Prize Winner (Wolf Hall won in 2009) although now I look back through the Man Booker archive, I have also read other winners like Yann Martel’s Life of Pi (2002), Michael Ondaatje’s The English Patient (1992) and have the 1982 winner Schindler’s Ark by Thomas Keneally ready to go on Audrey. But what does it really all mean? How can a small and select group of people decide what story shall be the best that 2012 has to offer? I’ve read 42 this year and Robert Harris’ Fatherland (#17) and Gregory David Roberts’ Shantaram (#1) stand tall in Gidday’s list of cracking reads so far. Neither of these are recent books (Fatherland was written 20 years ago, Shantaram in 2003) nor do they appear anywhere in the Man Booker archives. Sir Peter Stothard, the chairman of this year’s panel of Man Booker Prize judges, contributed a thought-provoking piece in yesterday’s The Times which made me stop and think about our relationship with literature. This year, the judging panel will have read 145 works of fiction (some 2-3 times) in the months leading up to October 16th when the winner is announced. That’s 102 more than I have read so far this year. Stothard claims that this year’s shortlist showcases some of our greatest prose-writers. He also says that he’s learnt to speak up for literary criticism, an act in itself which requires work and technique and an ability to argue critically the merits – or otherwise – of a particular book. Which, he says, is not the same as reading for leisure. He has also embraced ‘Kindle love’ whilst still advocating both printed books and the opportunities that bookshops and catalogues provide to explore material outside the domain of the publishing houses. He implores novellists to write novels first as opposed to writing novels for big screen adaption. And with his literary journalist hat on, admits a guilty preference for writing, from time to time, about subjects and themes rather than about a book itself. Great writing liberates us all, he says. 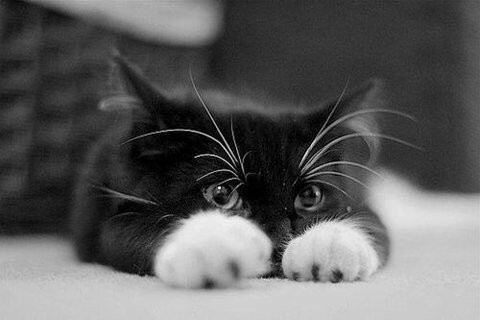 Expect to be resisted and keep an open mind. But consider that it’s not a fomulaic argument he poses. Perhaps great writing is a meeting of story and subtext – the author’s story and your own subtext – and the magic that occurs when new worlds are opened up and the story shapes us, even ever so slightly, though its tone and texture and sense of possibility. I felt the rhythmic intensity of Roberts’ Indian slums, the calculated humanity in Harris’ post war world and the cycle of hope and despair in the tiny boat tossing on the sea in Martel’s Life of Pi. Their story and my subtext: could that be the literary equivalent of a match made in Heaven? I figure if over 700 books (across five judges) have been read this year to give me this shortlist, the least I can do is give them a whirl! The bait I laid down. Well my The Nutcracker Advent Calender is empty and all the little storybooks are lined up below it so this can only mean one thing – it’s Christmas Eve and Santa Claus, Father Christmas, St Nicholas, Sinterklaas or however you know him, has packed up his sleigh and is on his way. 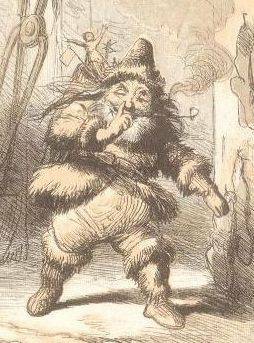 This morning I picked up my Top 500 Poems to see what had been penned about Christmas many years ago and in scanning the table of contents, one titled ‘A Visit from St. Nicholas’ seemed appropriate. Imagine my surprise when I turned to page 475 and read the first line – ‘Twas the night before Christmas and all through the house’. 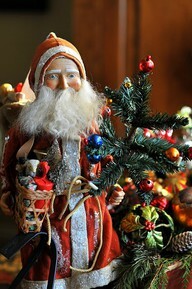 Every festive season since I was ‘knee high to a grasshopper’, my head has been filled with little snippets like ’twas the night before Christmas’, ‘a miniature sleigh and eight tiny reindeer’ and those famous reindeer names – Dasher, Dancer, Prancer, Vixen, Comet, Cupid, ‘Donna’ and Blitzen. This mere trifle has continued to shape the excitement and anticipation of Christmas Eve for children (big and small) the world over so it seems a fitting finale to this year’s Gidday Christmas Countdown. So I leave you to embrace the child within and wish you all the very best of everything your heart desires this Christmas. On, Comet! on, Cupid! on Donder and Blitzen!